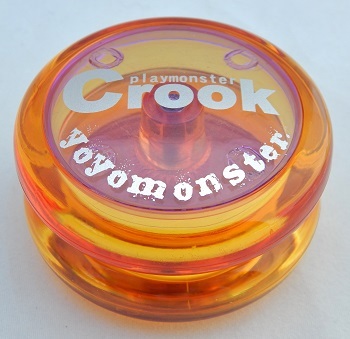 The playmonster series was designed to put the quality of yoyomonster in your hands for a low price, and the Crook is the third model in the series to deliver on that. 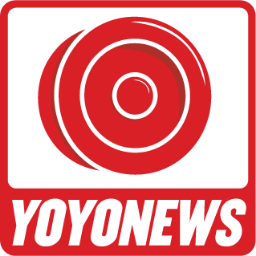 Crook was designed with input from top 2A (looping) players. Compared to other looping yo-yos, the Crook is slightly on the heavy side, giving you stability during looping, and helping you perform wrap tricks and around-the-body tricks easier. Little to no adjustment of the yo-yo itself is needed out-of-the-box. However, yoyomonster recommended that you wash the bearing and spacer prior to using it. The bearing did not come pre-oiled, so it was necessary for you to add a drop or two. Came with a free sticker. The model in this exhibit was first released in 2013.